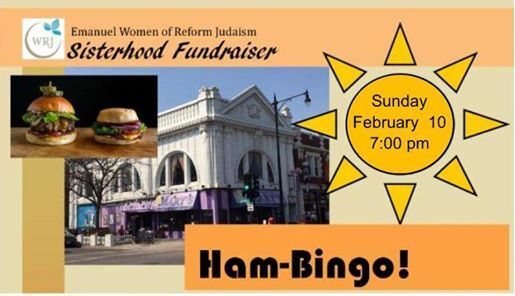 Come play bingo on February 10th, 2019 at Hamburger Mary’s Chicago in Andersonville. You will bet a booklet of 10 bingo cards for $15. Any additional booklet will cost an additional $10. There will be a total of 10 games, and a 50/50 raffle that you may enter yourself into. All proceeds go to the Emanuel Congregation’s Sisterhood Camp Scholarship Fund, which will send kids to camp this summer. To RSVP, please email WRJ@emanuelcong.org. All are welcome, and we hope to see you there!